Dresden is the capital of the German federal state of Saxony (Freistaat Sachsen). Dresden is located on the Elbe River and is an industrial, governmental and cultural centre, known worldwide for Bruehl's Terrace and its historic landmarks in the Old Town (Altstadt). Dresden became a city in 1206 and celebrated its 800th birthday in 2006. It was home to many Saxon princes and kings, the most famous of them being August der Starke (Augustus the Strong), whose kingdom included Poland as well. They appertained to the family of the Wettiner and were closely related to many other European royal families. Many buildings date from their reign. The rich art collections are testimony of their extreme wealth. The "Madonna Sixtina," for instance, was bought by the son of August the Strong. Dresden's most famous landmark, the Frauenkirche in winter. The last Saxon king abdicated in 1918. 75% of the historical centre of Dresden was destroyed by Allied bombing in 1945. These events have left deep scars on the city and are still remembered each year with processions and ceremonies. More than 30,000 people died in the bombing - the exact number is unknown. For many years the ruins and now the newly rebuilt Frauenkirche, with its gold cupola donated from the UK, acts as a call for peace among the different nations of the world. The historical centre is nowadays largely restored to its former glory, however some parts are still under reconstruction. Dresden has about ten million tourists a year, most of them from Germany. The Zwinger was rebuilt in 1964, the Semper Opera house in 1985, and the now most famous landmark of Dresden, the Frauenkirche, in 2005. When asked what they like most about their city, Dresden citizens will reply Old Town (which is quite compact, even though it has a lot of well-known attractions and museums of worldwide meaning), Dresden-Neustadt (an alternative central quarter) and the surroundings like the wine town Radebeul, the climbing area Saxon Switzerland, lots of castles, and most of the city landscape of about 80 quarters. The level of international tourism is growing, especially from the US and China since Dresden is a stop between Prague and Berlin. Architecturally, Loschwitz is the most interesting living quarter, despite it being a hilly landscape. Some people think that the sand stone buildings look black because of burnings or pollution. This is not true. Sandstone turns naturally dark as it ages. You can see the dark stones as well in the near by Saxon Switzerland and on pictures of Dresden from the 18th Century, where the sandstone-buildings are black as well. Dresden lies in the former German Democratic Republic and the GDR architecture is still easily visible in the city. In the city center The "Prager Straße" and the "Kulturpalast" are examples for classical GDR architecture. If you leave the center you will find a lot of apartment blocks, called "Plattenbau" as they are typical in Eastern Europe and Russia. Traces of World War II are not visible in the city anymore. Dresden-Klotzsche Airport is located north of the city and can be reached by bus (line 77 and 97) and tram line 7 (change for the bus at tram station Infineon Nord). Even faster is the connection with local train lines (S-Bahn, line S2) which takes 21 minutes to reach the main station. Flights leave to nearly all important German cities and a few European destinations, like Moscow and Zurich (but not London or Paris). The emergence of low-frills airlines Germanwings and Air Berlin has led to reduced fares to Cologne, Düsseldorf, Stuttgart and Munich. Lufthansa operates to most domestic destinations. Dresden is served by two big train stations, one on the northern side of the Elbe, Dresden Neustadt, and one on the southern side of the Elbe, Dresden Hauptbahnhof or "main railway station". Be sure to check if your train is really leaving/going to Dresden Hauptbahnhof or to Dresden Neustadt. The Dresden Hauptbahnhof is situated at the southern end of Dresden's main shopping street, Prager Straße, and is a short walking distance from most central attractions in Old Town. It is very well connected with the local bus and tram network and can be reached very quickly from nearly everywhere, even at night time. Trains to nearby towns, such as Meissen and Pirna run until around midnight. Trains regularly depart the main train station for the rest of Germany (Berlin, Frankfurt, Munich) and to Prague, Budapest and Wroclaw. The other big train station called Dresden-Neustadt is located just north of the New Town and also offers very good train connections, as most trains run through there, too. Some trains even terminate there and not at the main train station. Dresden-Neustadt is also easily accessible by tram or car. Dresden can be reached without problems by car from the rest of Germany. It is well connected with the German highway system and a new Autobahn to Prague has been finished recently. Flixbus has connections from all over Europe that can connect to Dresden. Eurolines especially connects Dresden from South and Eastern European Countries. But also connections between Germany, Austria and Switzerland are available. In the centre, especially in the historic part in Old Town (Altstadt), everything is easily accessible by foot. Note that the city center is not the geographical centre of the city. There is a combined system of trams (Straßenbahn), buses and even trains, but no underground trains. It works very well and connects all points of interest, but can be a little busy at peak times. Most lines run at night but at reduced capacity. This allows you to go out to most places or restaurants without bringing a car, including to far flung places like Pillnitz. See Dresdner Verkehrsbetriebe (DVB) website. Best is to get yourself a Day Ticket (€6.00) or, for families, a Family Day Ticket (€8.50). It allows you to ride on all trams, buses, most ferries and trains (except InterCitys and ICEs). It is relatively cheap and valid until the next day at 04:00. You can also get a ticket limited to an hour and some others, but Day Tickets are recommended for flexible travel in and around the city. As with most places in Germany, the public transit operates on the honour system: you are assumed to have a ticket, and there are a few inspectors out spot checking. The exception is on the buses after 20:00, when the drivers are required to see all tickets. The street network is very good and many roads have been refurbished recently, especially in the city centre. As in all bigger towns it can be a bit crowded during rush hours. There are many parking lots in downtown Dresden and it should not be a problem to find a place to park, except on Saturday shopping days. A number of automatic signs have been created, indicating the number of available parking spaces within the parking lots. Shops are open c. 10:00-20:00 and you will see a lot of tourists and locals going shopping in the city centre. Please beware of them when driving and note that this is the time with the fewest available parking spots. Car drivers might seem to be a little more aggressive than in other countries, but are usually more friendly if you don't have a local registration number. Bikes are the fastest thing in rush hour traffic if going a short to medium distance and if you're in good condition and not afraid of traffic and pedestrians. Bikes are also good for longer distances as they can be carried (with a separate ticket) in trams. There are many designated cycle paths (marked red on pavements, or with a white bike symbol on a blue background) and it is most times very easy to find a place to park your bike. But as anywhere else, always use a good lock! Many of the older streets of Dresden (particularly in the northern, Neustadt area) still have a cobblestone surface: not the most comfortable riding surface! Also, cobblestone is relatively slippery, compared to asphalt or concrete: care should be taken when riding in wet conditions. Dresden has a lot of pedicabs (bike taxis), mostly operating around the Old Town. They offer the typical (short distance) taxi service as well as guided city tours. Since 2007 there are also horse carriages that offer tourist sightseeing. One can also make use of the many bus tour operators. Tickets for these tours can be bought around the old town from various points. A night view of the Brühl's Terrace and quay of the Elbe as seen from Innere Neustadt. Dresden is a very beautiful, light spirited city, especially in summer, when you can appreciate the serene setting of the historic centre. Although Dresden is larger than Munich when measured by area, the historic centre is quite compact and walkable. Be sure to check out these places while in Dresden. Rollerblading or Rowing in small boats on the Carolasee in the Großer Garten. Paddle-Steamer Tour. Best start your tour from the main pier at the castle and go down to Meissen or up to Pillnitz or the Saxon Switzerland. Semper Opera - Be sure to book in advance. Villas and Villages - stroll arround through the many villa neighbourhoods like Blasewitz, Loschwitz, Kleinzschachwitz or Radeberger Vorstadt. They often have an village-style centre, eg: Strehlen very near to Großer Garden. 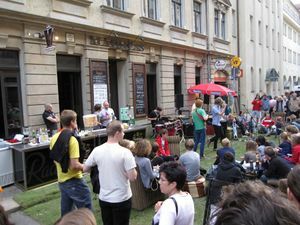 A concert in front of a bar during BRN 2009. Bunte Republik Neustadt (BRN) ('Colourful Republic Neustadt') - a massive yearly street festival that consumes the Neustadt part of Dresden in June. The festival consists of many stages featuring local musicians of different styles. The festivities run very late into the night with plenty booths offering a wide variety of food and drink. If you plan to sleep, then it is advisable to book accommodations outside of the Neustadt area during BRN. Dixieland Festival  - Europe's biggest Jazz Festival. It normally takes place within the second week of May (from May 10-14 in 2006) and attracts bands and visitors from all over Europe, America and the world. A great deal of the music is played on the top decks of paddle boats in front of the Old Stadt. Filmnächte (Film nights) (Jun-Aug) - on the banks of the Elbe, just across the castle on the other side of the river. A huge movie screen offers cinema in a beautiful setting and there are also many concerts with popular stars. Again, it is the biggest event of its kind in Europe! Christmas Markets - The Christmas markets lighten up an otherwise gloomy winter in Dresden. Starting on the weekend of the first Advent, the Christmas markets are open every day until Christmas. During this period, many Christmas markets open up throughout the whole city. Striezelmarkt, located at Altmarkt in Altstadt, is Germany's oldest Christmas market and is the largest in Dresden. Be sure to check out the booths offering various trinkets, including the famous wood figures (Räuchermännchen) made in the nearby Erzgebirge. Warm up with delicious mulled wine from the Glühwein Buden. But this market is crowded with tourist and the things they sell there are "0815" (boring) things. Shop in the main shopping area, downtown Dresden. 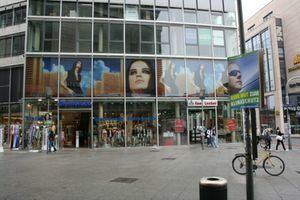 The main shopping district in Dresden extends from Ferdinandplatz to the west of Sankt-Petersburger Straße northwest to about Wilsdruffer Straße (search for Altmarkt). At the south end (Ferdinandplatz) is a cinema, a couple of restaurants, and a huge Karstadt department store (which also sells groceries). On the north end is a covered mall. In the Äußere Neustadt area (north/east of Albertplatz), many small shops provide books, vinyl records and clothing. The Innere Neustadt (between Albertplatz and Elbe, mainly Haupstraße and Königstraße) is rather on a medium-to-fancy level. Within the historic centre and especially around the Frauenkirche are a number of restaurants, serving many different tastes. Be aware, most of these are overpriced, and the quality is often low. On the north bank of the Elbe River is the Neustadt, which accounts for most of the trendy pubs, bars and clubs, and the majority of the restaurants in the city. You will generally have better luck finding decent food for a reasonable price north of Albertplatz in Neustadt. The eastern part of the city, toward the Blaues Wunder, has a lower density of restaurants than Neustadt, and they tend to also serve as cafés, and the food is generally tasteful and cheap. When in Germany make sure to try a speciality that is not regarded particularly as German at first sight. Today, doner kebab is typically served as a kind of sandwich in pita (flat bread). This type of doner kebab has been available in Istanbul since about 1960. The doner kebab with salad and sauce served in pita, which is predominant in Germany and the rest of the world, was invented in Berlin Kreuzberg in the early 1970s, because the original preparation was not appealing enough to the German taste. Therefore, as the "modern" kebab is very dissimilar to the traditional dish except by name, it can be argued that the kebab as most people know it is a "traditional" German dish. When in Dresden you can probably get the best kebabs at Babos  and at Dürum Kebap Haus  (Rothenburger Straße 41 or Prager-Straße 32). A typical dish including a large drink should be around €5-6. The next step above doner kebab is generally Italian. There are a certain number of ethnic restaurants scattered through the city, and if you go out to the eastern part of town, you will find lots of charming cafés and Volkshäuser that serve good food. Augustiner an der Frauenkirche, An der Frauenkirche 16/17, Phone 351 / 482897, German (Bavarian and Saxonian), €10-15/person, the beer is brewed on their own and is especially good. BoboQ Dresden , Prager Str. 2a, The fun drink from the Far East, BoBoQ Bubble Tea. Brühlsche Terrasse This terrace is adjacent to the river Elbe and various restaurants are to be found there - especially in summer time this a wonderful place to be. The view and the drinks are very pleasant. Engelbrecht , Damaschkestrasse 87, Phone 351 / 5211, Deutsches Essen, more than €5 for a snack. Italienisches Dörfchen One of the most stylish places in town - the baroque pavilion features various restaurants decorated with old paintings and furniture. The prices are higher than elsewhere, but still affordable. Go for the cakes! Kuppelrestaurant in der Yenidze (The Restaurant on the Dome of Yenidze) - Weißeritzstr. 3 - A restaurant with a superb view. Restaurant and open air terrace. International cuisine from 10€/person. Open daily from 12 pm to 11 pm. Münzgasse If you come as the tourist this is the place to go - lying directly beside the Frauenkirche. The little street is full of restaurants, from glamorous and expensive (for instance the Coselpalais) to the cheaper ones. Schießhaus, Am Schießhaus 19. This little farmhouse-restaurant is not so easy to find. It lies behind the "Herzogin Garten" (which is a ruin) and behind the opera-house. The large Biergarden is a very relaxing place, has good food and good prices and is very pleasant. If you are vegetarian try the adjacent "Brennessel". Die Scheune "The barn" is a restaurant with a large Biergarden in an alternative style - do not be shocked by the punks in front - they are decor. In warm summer nights you will have trouble to find a free place. Good prices. Serves Indian food. Lots of concerts and events. Raskolnikoff The formerly very alternative restaurant now features sand on the floors, a red lamp in front of the door and a very nice garden with a fountain. Again - in summer it is difficult to get in. Food and prices are good. Böhmischestrasse, close to the Lutherkirche. Rosengarten, Carusufer 12, on the north bank of the Elbe at the edge of the park just east of Albertbrücke. A café bordering one of the public rose gardens of Dresden's riverside park, with plenty of outside seating in nice weather. The food is acceptable, but nothing special. The view is gorgeous. Worth a stop for a hot chocolate or an ice cream. Curry & Co. , Louißenstr. 64, in Neustadt. Serves currywurst, a Berlin invention, with several flavors of sauce. Best pommes in the city. Also has vegan wursts and ice cream. There is also one in Schillerplatz. Brauhaus am Waldschlösschen, Am Brauhaus 8b, . Traditional German cuisine with a taste of beer brewed on place. Located on a hill with a splendid view over Elbe riverside from the outside garden. The food is recommended for those wishing to experience what the German cuisine should taste like. Devil's Kitchen, Alauenstraße , nice selection on burgers and other fast food with vegan and vegetarian options. Watzke Brauereiausschank am Goldenen Reiter, Hauptstraße 1, Phone 351/8106820, , €10-15/person, One of their 3 locations in Dresden and is a great place to go to taste Saxonian cuisine. Their self-brewed beer is fantastic. Hellmuts , Eschenstrasse 11, 01097 Dresden. Part of Rosis Amüsierlokal  and maybe the craziest restaurant in the Neustadt. It's a mixture of asian, rock'n'roll and classic german trash interior. Besides that, maybe the best burgers in town. At least the biggest. Cheaper prices for drinks and food on mondays.Vegan and vegetarian food available. Open 5pm to 1am. Keké, Louisenstraße 21 , you should try the stomped potato (called Kumpir) in Dresden Neustadt. Keké has the best Kumpir. Hot Shüzzle, Rothenburger Straße 9 , real thai streetfood. With a chef from Thailand, Hot Shüzzle has the authentic Thai food in Dresden! Kantine No.2, Görlitzer Straße , the best Burger in Dresden Neustadt. Just grab one and eat at the corner where all the people sitting and have bear from the Späti (like late shop for drinks). Pizzastube, Hechtstr. 12 , best Pizza at the edge from Dresden Neustadt. Some people say it's already Hecht (District) but you can walk there and it's worth it! Historisches Fischhaus, Fischhausstraße 14, on the road into the Albertpark to the northeast of the city, phone (0351) 89 91 00. There has been a fish house here since the 16th century (specifically 1573), long enough for the road to be named for it. Schillerplatz, Schillerplatz 9 Telefon: 0351/ 811 99-0 . Reservations recommended. Yes all the tour busses pull up here, but that doesn't stop the locals from heading to Schillerplatz either. A good selection of German cuisines, including an excellent schnitzel. In the summer, there is a huge biergarten along the Elbe and nice views of the Blaues Wunder. Villa Marie, Fährgässchen 1 (just below the Blaues Wunder on the west side) 0351-315 44 0  Excellent food, excellent ambiance. Italian food done really well. Reservations strongly recommended. Try to get it on Etage 1 with its views of the Elbe and the Blaues Wunder, or out on their garten. The Neustadt is a very popular destination, especially for younger people. It has a high number of bars and clubs, with many different styles. Especially the area around Alberplatz is filled with places to go. The area around the Frauenkirche and Dresden Castle is very popular with tourists. Some fine restaurants are located there. The Weiße Gasse is just around the corner of the Altmarkt near the shopping center and the historical town. Good alternative, if you do not want to go to the Neustadt. Bar Peanuts Brühlsche Terrasse, 351-864-2838, small, cozy bar is located at the corner of the Hilton overlooking the Elbe. Peanut shells are scattered on the floor and as the name suggests, peanuts are the central theme. Cocktails and beer are the main draws here, along with the spectacular view. Bärenzwinger  Brühlscher Garten, 351-495-1409, This popular student club is a good choice for its full schedule of nightly activities, including readings, live music, and discussions. club novitatis  Campus, 351-4674845, a student pup between main station and university campus. Have a look for current dates for live music and parties on homepage. Paulaner's Am Taschenberg 3, 351-491-2893, popular beer hall sells a selection of well-brewed local and regional favorites. A full menu is offered, and outside seating is available. Riesa efau  Adlergasse 14, 351-866-0222, Fax 351-866-0211, The pub is managed by a local events group and features a wide selection of drinks along with a regular slate of activities and entertainment. Good menu of regional beers and mixed drinks, as well as non-alcoholic drinks and coffees. Live music is frequently featured. Blue Note  Görlitzer Straße 2, 351 801-42-75, This is the Dresden Jazz point. In the web page you may find the schedule of concerts. There is always very good music. This is a place to sit and enjoy good music. The scotch bar has very good drinks to enjoy during the concert. Blumenau  Louisenstrasse 67, 351-31-51, This popular nightspot is considered one of the best in the city for its ambience, friendly service, and broad drink selection. Café 100  Alaunstrasse 100, 351-801-7729, This full-service nightspot features a café, wine bar, and pub. Café Europa  Königsbrücker Strasse 68, 351-389-923, This pleasant café and bar is a great choice for a pre-dinner cocktail or late-night snack. The café closes only one hour a day, so stop by any time. In addition to great drinks, the menu also features a full breakfast menu, which young locals and visitors appreciate after a late night on the town. Café Hieronymous Louisenstrasse 10, 351-801-1739, This bar is a great place to relax with a nice local beer or a glass of wine. Live music is featured frequently. The crowd here is young, and the service is friendly. Downtown , Katharinenstrasse 11-13, The most popular club in the Neustadt. They play mostly mainstream/top 40/80s music. If this place isn't your scene, you can always go upstairs to Groove Station. Groove Station , Katharinenstrasse 11-13, Sits on top of Downtown and has more alternative music. They often have live bands. Hebeda's  Rothenburger Str. 30, This pub is quite popular for the locals, especially on Friday and Saturday nights. The old East German furniture gives it a cozy and retro feel. Beer is cheap and there's a small dance floor for those who feel like dancing. Katy's Garage , Alaunstrasse. 48, If you're walking around Neustadt, you can't miss the beer garden at Katy's Garage. It's a great place to have a drink when it's warm outside. When the beer garden closes at around 10PM, you can make your way into their night club, which consists mostly of rock music. Lebowski-Bar , Görlitzer Str. 5, A tiny bar themed after the movie The Big Lebowski. Louisengarten, Louisenstrasse 43, Located a few meters from Katy's Garage, this beer garden is only open when it's warm outside. You can come here and relax with a Lenin's Hanf, a delicious beer brewed in the Neustadt. Mona Lisa Louisenstrasse 77, 351-803-3151, This city center nightspot features a Mexican theme and a full menu, along with plenty of beers and well-mixed drinks. Ost-Pol , Königsbrücker Straße 47, Ost-Pol (translation: East-Pole) is a fairly new bar with a retro East German feel to it. They often have live bands, but is still good to go for a beer when there's no live music. The beer is pretty cheap, and is one of the few places with Pilsner Urquell on tap. Pinta Bar  Louisenstrasse 49, Pinta specializes in cocktails. It is very popular on Friday and Saturday nights. When the place is busy, the service is slow. Planwirtschaft  Louisenstrasse 20, 351-801-3187, This quaint bar and restaurant is in a refurbished wine cellar. The drinks menu is extensive and served by an energetic staff. Rosis Amüsierlokal , Eschenstrasse 11, 01097 Dresden, Tel. : +49/351-5005305, Ask everybody in the Neustadt, they all know Rosis. It's a big but cozy bar/club/concert-hall with an included restaurant  and a pool hall  in kind of a trashy red-light district ambience with lot's of love for details. Extremly busy on weekends and mondays (studentsday with cheaper prices) and always a guarantee for a wild party. Don't miss to destroy yourself with a Rosis Rocket! Open everyday from 8pm to 5am. Free entrance. Studiobar Görlitzer Str. 1, The best cocktails in town are available here. Located on the 2nd floor, it is a little bit hard to find. From the entrance, go into the main floor bar and straight to the back. There is a stair case that leads up to the second floor. Smoking is allowed here. Sidedoor Böhmische Str. between Rothenberger and Martin Luther Platz. Good selection of beers and the tastiest Long Islands you've had since college. Jugendgästehaus Dresden, Maternistr. 22, (next to "World Trade Center" - train-stop "Freiberger Straße"); Tel. +49-351-492620, . Starts at €19. Located a few minutes by foot from the historic city centre, opposite the World Trade Center. Rudi Arndt, Hübnerstr. 11, Tel. +49-351-4710667, . Only 900 meters form the Hauptbahnhof in the quiet Swiss Quarter. Includes two dining rooms, two seminar rooms, a club room, terrace and cellar bar. Prices starts at €15. cityherberge, Lingnerallee 3, Tel. +49-351-485-9900, . The only hostel in dresden old town. Very central! A&O Hostel, Strehlener Str. 10, Tel. +49-351469271-5900, . Near the main train station, so it is very easy to get there and the prices are usually atractive. Lollis Homestay, Görlitzer Str. 34, Tel. +49-351-8108458, . Member of the I-hostels network . This homey hostel offers a well equipped kitchen, nice rooms, and free (old) bike rental! The bikes come in handy because it's in the north area of the Neustadt. Very highly recommended! Mondpalast, Louisenstraße 77, Tel. +49-351-5634050, . Very clean and bright rooms starting at cheap 10 bed dorm rooms up to ensuite doubles with balcony and TV. Offers a lounge and bar, as well as a self service kitchen. Wasserwerk Trachau, Aachener Str. 31, Tel. +49-351-8475445, . €45 for a single, €10 for each additional person. TV and WLAN inclusive. Lovely garden surrounding the old waterwork. Bus to the airport in front of the house. dresden-central guest apartments in city centre, Obergraben street 15, D-01097 Dresden, Tel. +49-351-3209460, . €74 per night for two person in a self catering vacation flat, €16 per night for each additional person. TV, Wi-Fi, operation costs and bicycles inclusive. 10 Min. walk to the Frauenkirche church and into the scene district. Ibis,  three of them in a row on Prager Straße, near the Hauptbahnhof. In addition to the standard rooms, the hotel offers studios for up to three persons and apartments for up to four persons. Mercure,  Hamburger Strasse 64/68 01157, (+49)351/42520, Fax (+49)351/4252420. The Mercure Hotel Dresden Elbpromenade is on the outskirts of Dresden. It has 103 rooms boasting contemporary design and Wifi access, which is also available in the public areas. Art'otel Dresden, Ostra-Allee 33, . Contemporary art gallery hotel with restaurant and bar as well as a healthclub and free wi-fi access. Hotel Am Terrassenufer Dresden, Terrassenufer 12, . Near river elbe and historic centre with outstanding view. NH Dresden, . Modern yet comfortable hotel, situated a short distance from the city and the airport. 269 recently renovated rooms are available, from €69. Luxushotel Suitess", *****L, A Member of Small Luxury Hotels of the World, An der Frauenkirche, Tel 49-351-41727-0; Fax +49-351-41727-160  Experience the gourmet terrace with its breath taking view to dome of the church of our lady "Frauenkirche". Kempinski Taschenberg Palais, Taschenberg 3, Tel 49-351-4912-0; Fax +49-351-4912-812 . 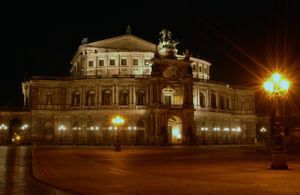 One of the finest adresses in Dresden. Hilton An der Frauenkirche 5; 01067 Dresden; Tel 49-351-86420; Fax 49-351-8642725. Next to Frauenkirche. Try to get a room with view on the Elbe river. Dresden is very safe in general. You can walk around the city center and most other parts late at night without having any worries. Local telephone code is 0351. There are some Internet Cafés in the city center. One is at the Altmarkt, next to Subway and another is at the back of the "Altmarktgallerie" shopping center at the Altmarkt. If you need medical attention, go to the Universitätsklinikum, Fetscherstraße 74; Tel +49-351-458-2036. It's inexpensive (compared to others in the city), easy to get to (Augsburger Str. stop from the 4 or 6 tram line and bus line 64) and the doctors are well-trained and, most importantly, speak English well. Glashütte is the center of eastern German watch manufacturing, with various watch factories and a nice watch museum . It is about 1 hour from Dresden by train, and part of the journey is beautiful, following a river through the mountains. Königstein Fortress One of the largest and best preserved late medeival fortresses in Europe. The fortress is situated about 30 km from Dresden and can be reached by almost all means of transportation. A trip on the river Elbe in one of the historic paddle-steamers of "Sächsische Dampfschifffahrt" is also highly recommended. Meißen - medieval cathedral and castle and home to the first European porcelain factory. Pillnitz - the old garden and summer castle of the former Saxon kings. Follow the road along the Elbe eastwards or take a city bus to get there. Beautiful atmosphere. You might have pay in order to get in (around €2), but this issue is not yet fully resolved, as there are many people against it. Radebeul - City west of Dresden with the world famous Karl May Museum and the four floor GDR museum. Radeberg - a small town a short S-Bahn ride away from Dresden. Home of the Radeberger Brewery. They offer tours throughought the day for €9, including tasting at the end. Phone ++49 3528 454 880. This page was last edited on 27 February 2019, at 18:50.